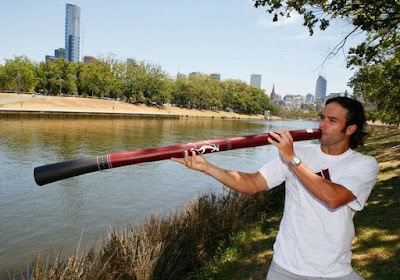 Fernando Gonzalez took time out to play a didgeridoo by the banks of the Yarra River during day one of the 2009 Australian Open. 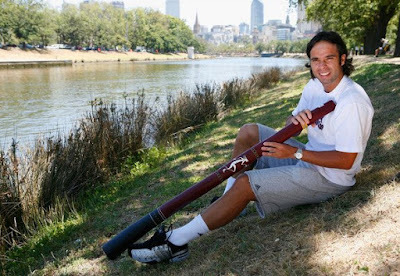 Gonzo is scheduled to take on homeboy Lleyton Hewitt tomorrow. 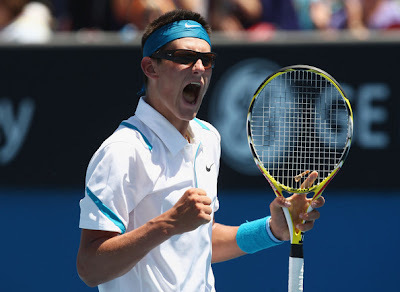 Whether Hewitt will make it to the next round or not, I don't think it's a big deal for Australia anymore because the Aussies have found Hewitt's successor in atomic boy, Bernard Tomic. Quoting from Forty Deuce, this 16 year-old boy wonder's future is so bright that he has to wear shades. Tomic defeated Starace Potito 7-6, 1-6, 7-6, 7-6 and will be facing an exhausted Gilles Muller in the second round. Poor Muller had to overcome Feliciano Lopez 6-3, 7-6 (5), 4-6, 4-6, 16-14 in a 4-hour, 23-minute match.